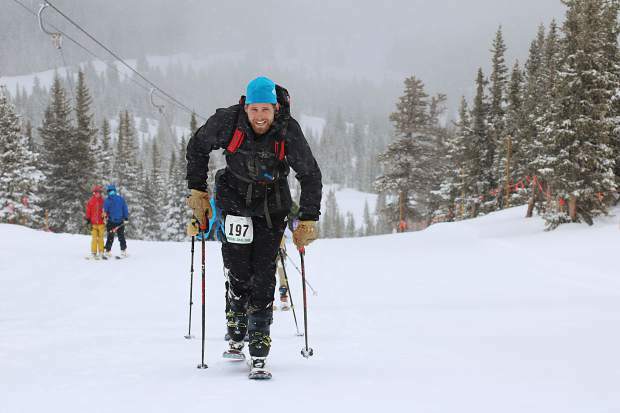 Patrick Crane skins up Breckenridge Ski Resort during April's 27th annual Imperial Challenge 'pseduo triathlon' race. The annual race requires participants to either run or bike nearly seven miles to the base of Breckenridge Ski Resort before skinning uphill to the Imperial Express lift before descending via snowboard or downhill ski. At the Breckenridge Town Hall on Monday evening, Breckenridge Ski Resort will host a community informational session about uphill access on its ski slopes. The discussion, to take place in the town hall’s council chambers at 6:30 p.m., will center around the resort’s uphill access policies, guidelines and safety information for the 2018-19 winter season. Last season, Breckenridge provided designated uphill-skiing routes across Peaks 7, 8, 9 and 10. On Peak 7, there was uphill access from Fort Mary B to Claimjumper to Lower Forget Me Not to the top of the Independence chair, returning down the same route. On Peak 8, uphill skiers were able to access a few different routes, including Springmeier to Upper Four O’clock to Lonewolf Access to the T-Bar Hut and returning down the same route. Another Peak 8 uphill route was the Gondola Ski Back to Lower Four O’clock to Springmeier, as was Lower Four O’clock from town to Springmeier. On Peak 9, uphill skiers were able to access Silverthorne to Lower American to Bonanza to the top of Beaver Run or the Mercury chairs, returning down the same route. And on Peak 10, uphill access was available from Silverthorne to Red Rover to Crystal to the top of the Falcon chair, returning down the same route. Peak 6 was closed to uphill access for the 2017-18 season. As for times when uphill access was available in 2017-18, Breckenridge only permitted uphill access from 5 p.m. to 8:30 a.m., which was outside of the resort’s public operating hours. All uphill users were also required to be clear of the mountain by 8:30 a.m. On Peak 8, uphill users were also required to be at or below Vista Haus by 7:45 a.m., due to the resort’s ski patrol work. Breckenridge last year also asked all uphill users to call the resort’s trails/winch cat hotline at 970-547-5627 before accessing the mountain.